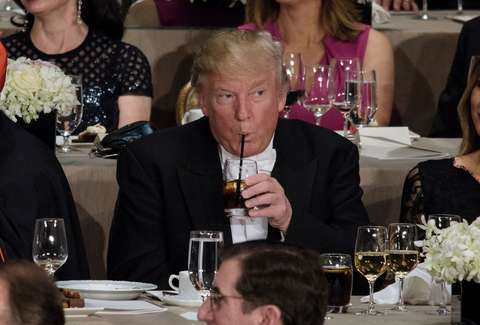 Donald Trump's penchant for wildly caloric fast food meals and bizarre condiment practices are practically common knowledge at this point, but that doesn't mean new details of his day to day eating and drinking habits have grown any less surprising. In fact, one recently unearthed tidbit about his apparent diet soda consumption is downright alarming. That's because according to a new profile in The New York Times, he drinks 12 Diet Cokes per day. Love it or hate it, there's no arguing that Diet Coke is wildly popular -- depending on the data you consult, it's the second or third most popular soda in America. However, whipping through a 12-pack of DC during one's waking hours is a bit excessive. To put 45's consumption in perspective, a 12-can-a-day habit would put his annual Diet Coke intake at 4,380 cans per year, which altogether amounts to roughly 411 gallons of the caramel-colored fizzy stuff. For comparison, the average American drinks just 58 gallons of water per year. As the profile describes, Trump frequently "summons" Diet Cokes using a special button throughout the day in the White House, but to plow through so many in a day, he's got to keep up quite a pace. When you consider he's likely awake for 16 or so hours per day (slightly more than the average American), he's finishing about three quarters of a can every 60 minutes. Trump has yet to confirm or deny the NYT's reporting on his daily Diet Coke intake, but he did take to Twitter on Monday morning to slam the paper for reporting that he watches four to eight hours of TV every day in the same story.